The weather in the US has been cold and dreary. Many of us are dreaming of sunnier days that seem like they will never come. While spring is right around the corner, it seems so far away. While we shiver, we can start planning our trip to Poros, Greece! 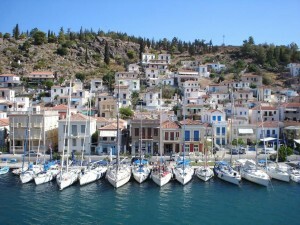 Many of AESU’s trips end in Greece and you have an opportunity to relax in Poros for 3 days! Poros has so much more to do than sit on the beach, relaxing, and soaking up the sun rays by the Aegean Sea! It may be a small island but it certainly doesn’t lack entertaining things to participate in! You can stroll through the ‘Lemon Forest’ where you can discover some of the best views on the island. Renting a bike is another great way to see the island! If you are looking for the best view for photographs to capture the breathtaking scenery, hike up to the historical Clock Tower to get that perfect landscape shot of land, sea, and sky. To step back into history, visit the Monastery of Zoohodus Pigi, a place of significance during the Greek Liberation War in 1821, was home to Greece’s first orphanage and has held valuable religious objects, including the Holy Relic of John the Baptist. Alternatively, immerse yourself in village life by strolling through town to take in the waterfront cafes, florists, shops, and taverns. If you are lucky enough to find yourself there during the first two weeks of July, you can go to Hero Square to celebrate Sailor Week with the locals, which is organized to honor the sailors of Poros. This festival is only held every two years, so plan accordingly! You are on a gorgeous, Mediterranean island, so why not seek a water adventure? Poros has two coves that are excellent spots for snorkeling. Spend a day kayaking, rowing, windsurfing, water skiing, jet skiing, tubing, and so much more. The beach brims with life day and night, so if people-watching appeals to you, then that’s an activity you can partake in during anytime of the day! Be sure to check out all of our great Travel Tips for Greece and the Travel Tips for Europe before you head overseas. This entry was posted on Thursday, March 6th, 2014	at 1:48 pm	. You can follow any responses to this entry through the RSS 2.0	feed. Both comments and pings are currently closed.